While the ecosystem ponds we install are typically lower maintenance than other types of ponds, there will always be a need to perform maintenance throughout the season. Here are some quick mid-season maintenance tips to help keep your Kalamazoo pond looking its best. Your pond filtration is designed to collect most of the undesirable biological material in your water, as the water flows through the filter media. When your filter gets bogged down with biological material it won’t be able to do its job properly If you are seeing poor water quality, be sure to clean or replace your filter and watch for water improvement. 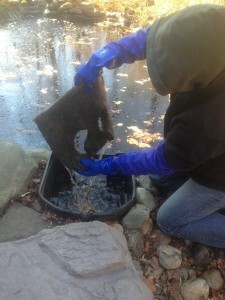 When checking your filter media, also check the skimmer basket for any debris that has fallen into the pond. Any organic material that sits around in your Kalamazoo pond, can contribute to poor water quality. It’s too early to completely prune your pond plants because they are still growing and flowering this time of year. But there may be dead leaves around the outer base of the plant. Make sure to check your pond plants, and remove any dead plant material. If the plant material falls and collects at the bottom of your pond, you may experience poor water quality, which can lead to bigger problems later. While the Kalamazoo ponds we build are ‘low maintenance’, there will still be maintenance that needs to be performed throughout the year. A quick mid-season checks up isn’t typically a full-on pond cleaning, like we perform in spring and fall. 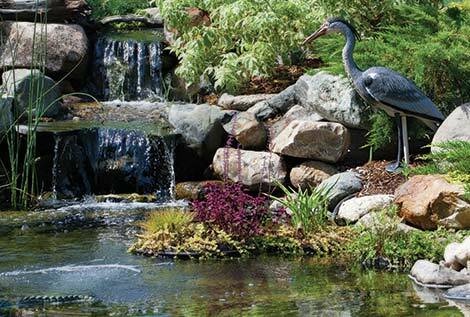 It is more of a ‘sprucing up’ of your pond and making sure everything is functioning properly. Contact us today to schedule your mid-season maintenance, and be sure to check out our recent projects, as well as answers to frequently asked questions!